btw where did ya get the custom skin done at? I seriously love this kit. And I love seeing someone else use a red color sound ride. The bell on them things are amazing. love the comic book drums killer, also the skin was custom made by Dark horse percussion..my little idea nugget come to life!!! Very nice! Now tell the bass player to drop the Behringer crap! You should seriously tell your singer that you do not care if it´s "his style" and that "you can not cramp his style" or whatever, he can not put his foot up on your new drums no matter what if you ask him not to do it. It´s just common courtesy and the respectful thing to do. If he says he just can not perform without his foot on top of a bass drum, you can perhaps suggest that he just buys his own bass drum to bring to gigs. Could probably find a cheap Percussion Plus somewhere, and it´d give him a nice perspective to actually lug some stuff around like the musicians in the band. 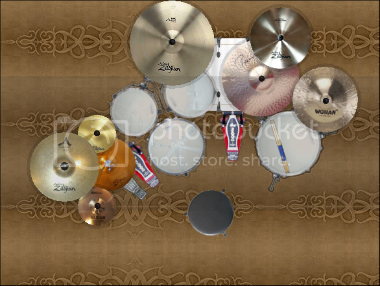 Holy crap, love that Paiste ride. wmpdrummer13 wrote: My bad it is not all TMNT it has all kinds of comic book figures on it as well. He is huge into comics, he actually owns a comic book company called Torpedo comics. Are dolmayan's rack toms really that high up and his floor times really that low? That's an awesome kit finish for both giveitalls and dolmayan's kits.